Nonnecke, I.l.. "Tomato". The Canadian Encyclopedia, 22 March 2015, Historica Canada. https://www.thecanadianencyclopedia.ca/en/article/tomato. Accessed 20 April 2019. Tomato (Lycopersicon esculentum) is a herbaceous perennial which, in Canada, is grown as an annual because of early frost. Tomato (Lycopersicon esculentum) is a herbaceous perennial which, in Canada, is grown as an annual because of early frost. Fruits range from a few grams to over 450 gm. 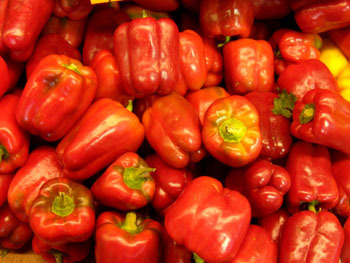 Tomatoes are usually red or orange but may be pink (colourless skin) or yellow. Tomatoes contain vitamin A, thiamine, riboflavin, niacin and ascorbic acid. Worldwide, 2 species are cultivated, L. esculentum (including common, cherry, pear, upright and large-leaf varieties) and L. pimpinellifolium. The tomato originated in Peru and was used by the Indians of South and Central America in precontact times. Introduced into Europe in the 16th century, the tomato was viewed with suspicion as a member of the nightshade family. There was no known commercial production before the early 1800s. Outdoor production is limited in Canada by the coolness and shortness of the summer season. 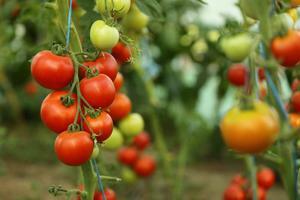 Tomatoes must be started by seeding and transplanting in a greenhouse. When frost danger is over, they can be transplanted to the field, where cloches or other forms of shelter can bring on an earlier start. If night temperatures fall below 14°C, many tomato varieties fail to set fruit. For good production about 70-90 days of temperatures in the mid- to high 20s °C are required. Crowding of tomato plants results in earlier maturity. Most Canadian soils must be irrigated to supplement rainfall. Tomatoes are subject to blossom-end rot (in erratic water regimes), all forms of plant disease and insect damage. Warm-season plants, tomatoes are grown commercially, predominantly in southern Ontario. Tomatoes are grown on about 7000 ha across the country, producing from 500 000 to 550 000 t, valued at between $75 and $80 million. Ontario accounts for more than 98% of the production. The greenhouse tomato industry has expanded significantly since the early 1990s and plays an important role in the fresh tomato industry. Canada is the main producer of greenhouse tomatoes in North America. Annually, more than 250 000 t of tomatoes are produced in greenhouses, with a value of around $500 million. Again, Ontario is the largest grower, although greenhouse production occurs across Canada. Tomatoes are also grown in Canadian home gardens, season permitting.